The five biggest questions for CAU football heading into 2017. With football season just under two months away the Clark Atlanta Panthers have an opportunity to prove that they are not just a basketball school. Coming off a SIAC basketball championship and a splash hiring for the women’s program, head coach Kevin Ramsey hopes the buzz around the AUC in November will be all about football and not necessarily the beginning of hoops. The Panthers’ chances of owning the room past Halloween will come down to the answers of these five questions. Will Johnathon McCrary dominate the SIAC? Johnathon McCrary would easily get my vote for SIAC Preseason Player of the Year (If I had one). He threw for the most yards in conference games last year, going for over 1300 yards with nine touchdowns and just a tick under a 55 percent completion rate. He also had as many interceptions as touchdowns but there is no denying that if he plays at the same level or higher this season he will be the standard bearer for quarterbacks in the league. With Tuskegee, Fort Valley, Miles and Albany State all losing seniors who were all arguably top five quarterbacks in the conference last season, a newcomer or young player would have to play with their hair on fire to unseat McCrary as the league’s best. Will the pieces around McCrary make his life easier this year? Having the top receiver in the conference returning will be a huge advantage. In seven conference games last year Dre Martin was the only receiver to eclipse 500 yards and along with teammate Trenton Earl the only receiver to average over 20 yards per catch. Martin was a freshman last year while Earl was a senior; so the good news is that he’ll get even more opportunities, the bad news is he may get more attention from opposing defenses. Earl leaves a big void to fill with the 1-2 punch he and Martin served up last season, but the man who will be missed most on the offense will be starting left tackle Tyshon Henderson, a second-team HBCU Gameday All-American who has exhausted his eligibility. Henderson played every snap last season and led the offensive line in knockdown blocks. Despite his stellar play the Panthers were second worst in sacks allowed last year at 21, so that’s definitely an area to watch. The Panthers are solid at the center position however, Darius Preyer is a three-year starter who always gets graded highly in film sessions. Can the Panthers cut down on their penalties and turnovers? 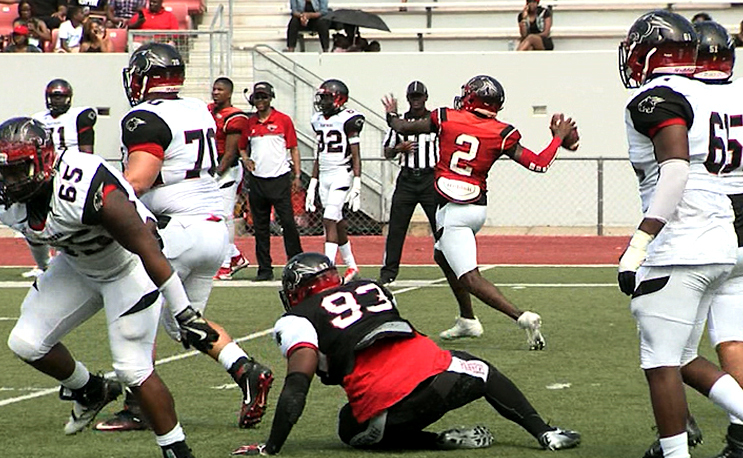 The offense was second to none last year in the conference, but it was offset by penalties and turnovers that stymied CAU’s shot at a championship. The Panthers gave up 900 yards of penalties in conference games last season, far and away the worst in the league. By comparison, Morehouse played one more conference game, eight as opposed to seven, and only gave up 495 yards. Their turnover margin was a sore spot as well, giving up the ball 12 times more than their opponents, again putting them last in the conference. These two pitfalls were the main reasons they lost a big lead at Fort Valley early in the season, giving the eventual champions just enough leverage to overcome their slow start last year. That “woulda-shoulda-coulda” game in Fort Valley could have given the Panthers some breathing room late in the season before they were eventually eliminated from the championship chase. Can the Panthers put pressure on the opposing quarterback? The Panthers were towards the bottom of the SIAC in defensive sacks last season, picking up 14 in seven games. Every armchair hack in the world knows the best way to disrupt your opponent’s offense is to put pressure on the quarterback. The coaching staff has tons of confidence in Kenneth Morgan and Kamari Jackson, two defensive backs who played as true freshman last year and finished the season on a roll. Jackson was supposed to redshirt last year and play receiver but neither of those things happened, the coaches realized he was one of their best cornerbacks so they converted him and got him onto the field by the fourth game of the season. Morgan got better as the season went along and finished the year with back to back interceptions in the last two games. If those two can keep the receivers in check, it can open up the possibility of more coverage sacks for the front end of the defense. The biggest contributor on defense may ultimately be Jaquatin Victrum, who was the second leading tackler on defense last season as a defensive back. He had three games with 12-plus tackles, which isn’t always a great sign if your last line of defense has that many tackles. Ramsey with the confidence of Jackson and Morgan in the backfield is going to shift Victrum, during this year’s spring game he told me that he plans on moving him to the middle linebacker role. That move could afford Victrum the ability to get to the quarterback more often which would be a plus for the Panther defense. Can the Panthers survive the early season schedule? The road looks to be a rough ride early on for Clark Atlanta. Starting at Week Three they have consecutive road trips to Tuskegee, Lane and then a date with Grambling in the Chicago Football Classic. Tuskegee is always a tough place to play and Lane could be a sleeper right in the middle of that Tiger sandwich. CAU will be a clear underdog against Grambling, but that game is more about exposure and the ability to generate some revenue. A win in that game might not be on the scoreboard but instead equate to not getting any key players injured versus a bigger and deeper FCS school. If CAU can make it to October with a 3-2 record and a decent showing against Grambling, one would have to imagine the coaching staff would be happy and feel confident that a championship run would be on the table. When the leaves turn and a chill hits the air in November, maybe coach Ramsey and his guys will still be in the spotlight.